Europa Group Hotels - "Europa Royale" and "Europa City" are located at the prestigious locations of the biggest cities in Lithuania, Latvia and Romania. We are committed to provide the exceptional lodging, conference organizing, dining and SPA services to our guests! In the very center of Vilnius Old Town next to the famous amenity of Vilnius - Gates of Dawn is located the four star hotel Europa Royale Vilnius. The famous Vilnius sightseeing places, museums, restaurants and nightclubs are just a walking distance away. Explore the unforgetable capital of Lithuania with your family and friends! When travelling to Vilnius on business or leisure purposes, you are more than welcome to stay at the 3+ star Europa City Vilnius hotel. A vibrant and modern hotel is located in the centre of the city, next to the Parliament of the Republic of Lithuania. Explore the nearby business and financial areas, cultural sightseeing places and the capital’s numerous nightlife options. The hotel is perfectly suitable for the ones which seek the great value for money! In the centre of the city, just a walking distance away from the popular Laisvės Avenue is the four-star Europa Royale Kaunas hotel. The most popular entertainment and shopping center - Akropolis is located 3 minutes away! There are plenty of sightseeing places, restaurant and nightclubs in the vicinity as well. The hotel is an ideal place for people coming here for business or simply to relax. In a thoroughly reconstructed 19th century building formerly known as the famous SPA of the Czar was established the four-star Europa Royale Druskininkai hotel. The hotel is very popular among the people which seek to relax and treat themselves with numerous health and beauty treatments. Perfect for families and romance seekers! 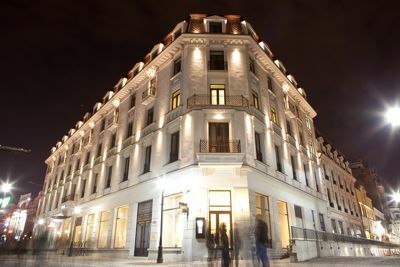 In the city centre next to the historic and picturesque Verman Park is located the four-star Europa Royale Riga hotel. The historical house of the legendary Benjamins was fully restored in 2006 and became a luxurious hotel. Explore the famous sightseeing places, cafes and restaurants of Latvian Capital City. The hotel restaurant Benjamins and the Casino are also located at the premises. The hotel is perfect for the ones which seek to feel the history of the famous Benjamins House while enjoying all the nearby Riga amenities! On the bank of Trade channel in the very center of city, only 15 minutes walk from unique white sand beach is located the four-star Europa City Amrita hotel in Liepaja. Hotel is preferred for businessmen and those travelling on leisure, friendly for families. In the very heart of Old Historical Center of Bucharest is located the four-star Europa Royale Bucharest hotel. A 19th century building overlooking the Unirii Square, next to “Hanul lui Manuc” restaurant, has become an elegant four star hotel. Europa Royale Bucharest has 92 tastefully decorated, fully air-conditioned guestrooms, and offer all facilities for a very enjoyable and relaxing stay in the heart of medieval Bucharest.